It's sad to see that Scott Minto's career has finished due to an ankle injury. Scott played an important role for Charlton in the early 1990's and left for bigger things at Chelsea. In the end, it didn't quite work out at Stamford Bridge and he played for a number of other clubs, including Benfica, and for West Ham at The Valley against Charlton. Scott was always one of my favourites during his playing days at Selhurst and Upton Parks, and then at The Valley. He always gave 100%, and was good enough to keep other recognised full backs (Mortimer, Barness) out of the team from a very young age. Scott now plans a career in journalism. This week, this blog is a year old (not much older than Lennon pictured left!). It started out as Shouting from the Hop, but I quickly decided to maintain a separate football (Charlton) blog from that of the other stuff I wanted to blog about. 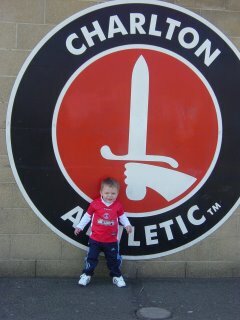 Initially, I was bought the URL (www.charltonathleticonline.co.uk) as a Xmas present by my girlfriends parents. It took me about six months to do anything with it, and as I have little experience of creating a website, doing a blog (and linking it to the URL) seemed the best option. I know I am not the first (All Quiet I believe...), the best (Frankie does take some beating...), or (hopefully) the worst, the most optimistic or downbeat, rudest, most arrogant, or full of rumour. I do get my content stolen by the English-Football website (sorry no link given, understandably), so maybe I'm doing something right? I do not claim to know the groundsmens mate's brother who spots footballing superstars arriving at the training ground for medicals but I did work with JLloyd Samuel's step mum and can ask her if he is re-signing with us the next time this particulor rumour crops up. I therefore do hope that the 15,000 plus readers I've had this year get some small amount of enjoyment out of my opinion (which is all this blog claims to contain). I've had my moments - the shirt sponsorship piece I wrote went down quite well, as have a few other reminiscences; sadly, my spoof about the club suffering as a result of all:sports administration did not go down at all well and had to be removed...we all learn from our mistakes! I intend to continue with the blog for as long as I can - work now takes up more of my time this year than last (when I didn't have a proper job!) - and hopefully I can continue with match previews, reports, and opinion on transfers, complaints, and what it's like to continue to be a Charlton supporter after a whole bunch of years. This season is going to be different - a new Head Coach; new players, some quite young being signed and possibly given a chance; smaller crowds than for several years I expect, and if we have a poor start, a whole bunch of whingeing about anything and everything. Since this blog started, we have said goodbye to Curbs; Murphy; Jeffers; JJ; Bartlett; Deano; Chrissy; Smerts; and a few others decent players (on their day...). We have welcomed in Dowie; Myrhe; Sorondo; Ambrose; and Marcus Bent; and after Walton, we are promised more signings (possibly even a Hasselbaink!). All I've ever wanted for Charlton is for them to progress - some years we do it on the pitch; some years it doesn't quite work that way but the club grows stronger off the field. Improvements at Sparrows Lane may not go down well with the fans who want to see money splashed on players, but ultimately, the assets improve, and the club is better off, and that is later reflected back on the field of play. We are a Premiership club with a Premiership team, playing in the English Premier League. We are not a small club anymore; we might not be as big as others (who love to remind us of that fact), but we are a whole site bigger than many more who would love to be where we are. The World Cup is finished; the players are about to return to training (at least none of them played in the World Cup and can be considered tired yet...); onwards and upwards..hopefully! Thanks to Roger and Julia, Rachel, my dad, Pete/Sophie/Lennon, plus everyone else who loves this club. 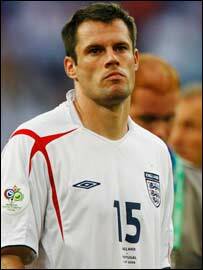 What is it with England and crashing out of tournaments on penalties? Italia '90, England '96, France '98, Portugal '04 - all lost on spot kicks. 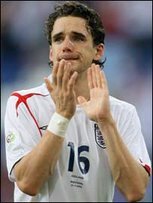 We - England - have won penalty shoot outs before; we beat Spain in Euro '96 before the Germany Semi final catastrophe, so it can be done, but we have now lost a lot more than we've won. What are the reasons for this - is it pressure? That should be the same for both sides. Expectation - why more pressure on England than Portugal yesterday? Better keeper or penalty technique? Maybe, but would you pick Ricardo or Lehmann in front of Robinson, or Seaman or Shilton in years gone by? Way back when I was young, I saw a German movie - The Goalkeepers Fear of the Penalty Kick. It was a bit arty-farty, and involved murdering girlfriends etc, but the crux of the question why he did it was based on being a goalkeeper and facing a penalty. You stand there, and hope to save it. Ok, what to do? Do you just dive one way (ala Robinson, Ricardo, Lehmann, etc) and hope that the kick went that way, or presume you are good enough to save the kick when you see which way it goes (ala Shilton '90 or Seaman '96) or maybe do some homework (ala Keily vs Croydon) and study where the taker puts his kicks, or just stand up and hope it comes near you (Andersen vs Chelsea in the League cup). All four tactics can be good enough. But what if the kicker knows that you are going to do one of those four - which he obviously does - and what if he knows exactly which one you are going to do? And what if you know that he knows! Shilton had little chance in '90 because, I believe that, the Germans knew if they hit the ball hard, he wouldn't be able to get there in time. If they had placed the ball in corners deliberately, he may have saved one. In '90 and '96, the German keepers just stood there and hoped for an English mistake - Waddle and Southgate obliged. This is the conundrum, if you know what to do, but don't know if your opponnent knows what you are going to do, what do you do? Lampard nearly always places his Premiership kicks to the goalies right. He probably knew that Ricardo knew this; he switched sides yesterday and the kick was saved. Gerrard always thumps his, Ricardo knew and stood and saved. Carragher (left) put his first kick to Ricardo's left, then switched on the re-take. Why? Because Ricardo knew which way he wanted to put it. Is this pressure from media, players themselves, fans, expectation, or all the above? Yes. How can you control this - you can't. Charlton have been in shoot outs before and since - I've seen us lose at Cambridge, win at Everton, and beat Luton too fairly recently, and there have been others I don't recall the details of. Charlton are no better than any other team when it comes to taking penalties, and we haven't had a specialist penaty saving keeper either over the years. It's over, for another four years at least... The high hopes of a successful World Cup campaign for England have been shot down in flames, and now, as the tears are wiped away, the inquests will start. This team was supposed to be the one; the players that were at the peak of their form and experience, and with the heirarchy to take on the World. How did we do? Pretty poorly, once again knocked out in the quarter finals. So what went wrong? How much can I write about Sven? Lots, but the facts are that he has ultimately failed to take the team forward. When Keegan quit, he was the new Main Man - respected thrughout the World as a top coach. In the end, the English way of building someone up, and then knocking them down can have few greater examples than the Swede. If he bedded someone, it made front page news; if he talked to someone about another job - it's all over the media; he was easy to dupe, and guess what, that made headlines too. Sven leaves the England coach role now, and most fans will say good riddance. The memory of Munich and beating Germany 5-1 all those years ago is long gone (and my socks gloryfying that result have holes in them...); he will be remembered as a womaniser who made lots of mistakes when it mattered. Becks; great beer, crap captain. 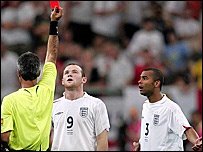 It is unnacceptable for a player to get one free kick (or corner) right every five attempts; how England can put up with that is beyond me, because if it happened at The Valley, the crowd would go mad. Can you imagine Rommedahl hitting the front man with 80% of our corners? No, nor can I... Beckham makes millions through sponsorship, has had a good career, and should now be politely asked to step down and make way for players like Lennon, Wright-Phillips, Walcott, etc. STOP PRESS - as I type, Beckham has quit as captain, so there one good thing! The biggest single area of inquest will be the Premiership. UEFA have already said that they want to reduce the number of competing clubs down to 18 (from 20), but that means reducing the income from gate receipts, which most clubs will not vote to do. It probably wouldn't effect things though, as the TV money would be spread out within a tighter bunch, and anything lost from matches made up from TV revenue. This in turn should help fitness (with fewer games being played), which should help the England team. But it doesn't work like that... As soon as the season is reduced, other games will be arranged, either through UEFA extending the European competitions, or through clubs arranging lucrative friendly matches, that compromise the games played/fitness equation. I said it prior to the squad being announced, and again when the names became known, that Sven got it majorly wrong in taking only four forwards. When we now think that two were injured (or recovering from injury), one was a shock tactic, and one only there ultimately for experience, we were asking for trouble. With Owen being injured and Rooney sent off, our potential semi-final with France would have seen Crouch start up front on his own, and be asked to do up to two hours there. He's slow as it is, so how he could have done a whole game and extra time is beyond me... As for Walcott, well I hope he has gained from the experience, because if he isn't in the team/squad for the next Euro championshoips, then it's just been wasted. The lucky ones end up being Bent and Defoe, who haven't been tainted by the mistakes. 4-5-1? Rooney up front on his own? When was this tried and tested? Holding player - well set before the trip? Oh yea, let's try something in a live situation. Sven, you wouldn't last five minutes as a project manager in the real world! We need to be winners, yet our media is run by an Aussie who takes heart from crushing our every decent star. Get rid of the Sun, News of the World, and Times owner, and the country can move forward. Pluses - Hargreaves in midfield (not full back!!! ), Cole at left back, Rio, Gary Neville showing what we could do with a proper right back in the team, Lennon, and not much else. Steve McLaren - oh dear. But hopefully, no Beckham; a switch to 4-4-2; Lennon, Bent, and a young hungry team; no favourites; positive tactics.